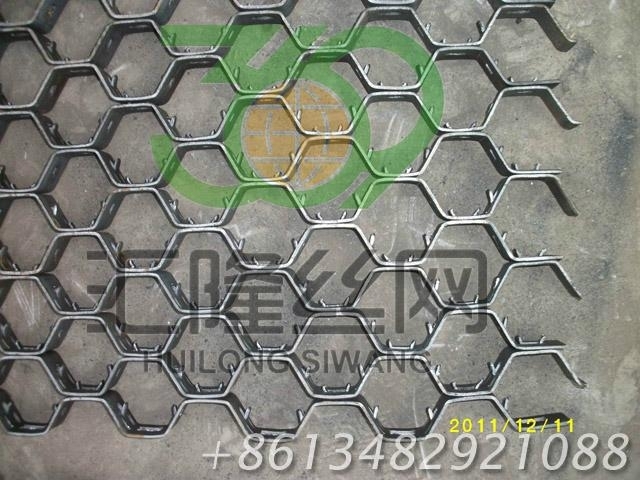 Hex Metal Grating, also named Hexsteel, Hexmesh, Hexmetal, Hex mesh, Hex steel, is a hexagonal cellular mesh grating specifically designed for reinforcing both linings and flooring. It acts as a surface framework to hold cement or refractory in position, and relieves stress in the lining's upper crust, which prevents spalling and cracking. Since Hex Metal's flexibility allows it to be rolled, it easily conforms to circular shapes. It is ideal for refractory lining Ducts(Elbow), Furnaces, Reactor Vessels, Cyclones, Flue Gas Lines, Catalytic Cracker, U Actifier Ducts, Acetifier Reactors, and other high temperature equipment of virtually any shape or configuration.